The identity matrix times c.
A matrix which is symmetrical about the leading diagonal. A matrix which is antisymmetrical about the leading diagonal (term on other side of diagonal is negative). Imagine we want to rotate a point P1 (denoted in the above diagram by the blue vector). The axis we want to rotate around is denoted by the red vector. 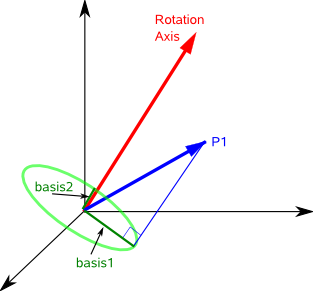 The track of the point as it rotates will form a circle (shown in green) in a given plane. In the diagram below this plane has been moved down so that it passes through the origin. 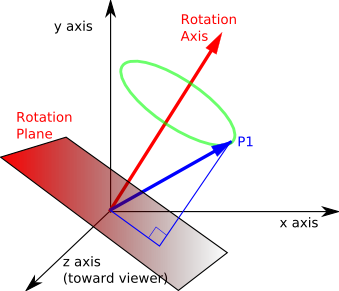 This plane is defined by the rotation axis (the plane is perpendicular to the axis). 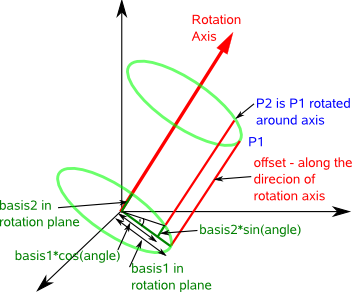 We now want to generate two basis vectors in the plane which we can use to define the circle in our global coordinate system. To get one of these basis vectors we can cross multiply axis with P1, this gives a vector in the plane at 90° to the projection of P1 onto the plane. 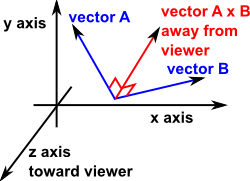 For information about vector algebra and cross products see this page. × = vector cross product. 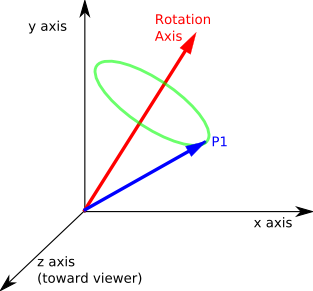 P1 = point being rotated. The first basis vector is just the projection of the vector P1 onto the plane (Projection of a line onto a plane is explained on this page). However this uses vector algebra, we need to convert this into matrix algebra, we can do this by using the skew symmetric or 'tilde' matrix as described on this page. For information about the derivation of this see message from Sven. An alternative way to do this conversion might be to represent the rotation as two reflections as described here. The standards used for matrix notation are defined here. As you can see here, this gives the result that we are looking for. I have put a java applet here which allows the values to be entered and the converted values shown along with a graphical representation of the orientation.